I tend to take my knitting everywhere with me. Waiting to pick up one of my kids from school…. Even sitting at the pool for the kids’ swimming lessons. Of course there is my usual spot on the couch at home. Anywhere I am waiting, or just resting at the end of the day! There is a yarn project sitting there with me. A quick nod to Knittinghelp.com! I was so delighted to see that one of my go-to sites for knitting help, Knittinghelp.com has linked to my blog! Thank you so much to the mod there who linked to my pattern for big squishy bed socks. I have found their videos on knitting techniques, from the simple ones to the complicated ones, just so helpful over the years! Thank you! I am just so excited about how this little layette has turned out. I mentioned in my last post that a dear lifelong friend of mine is about to become a grandma, so of course I just had to make a few sweet baby things for the new parents. I started by making these adorable little booties. Two pairs of them are made from leftover sock yarn. The lighter pair was a skein of Knitpicks Bare that I’d dyed with Easter egg dye. The second pair was made from Pagewood Denali merino sock yarn. The third was some superwash wool (Liberty Wool by Classic Elite) that was a scarf for me… sadly I ran out of yarn for that pair. I decided to use a little yarn to finish off the second bootie that had come from a set of hats, socks and fingerless mitts that I’d made last year. They were for my friend’s late husband who sadly passed from cancer about a month ago. The colors were fairly close and I thought it would be a good way to send a bit of something I made for him to his granddaughter. 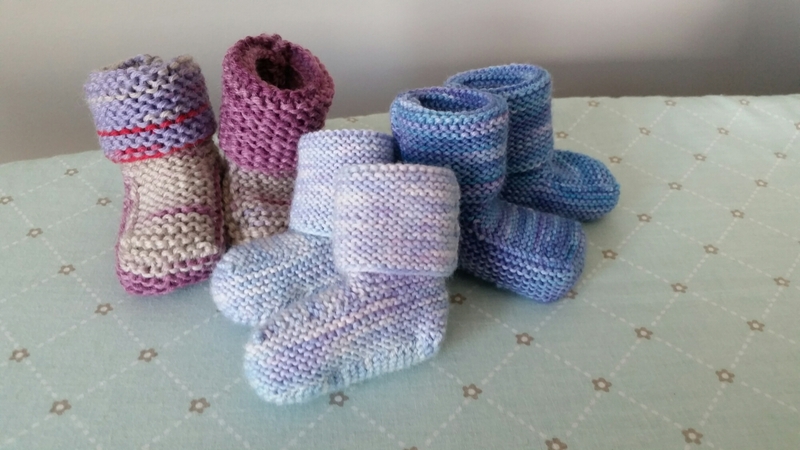 The bootie pattern is called Stay-On Baby Booties and it is an old Norwegian pattern. There was a pattern correction that I found and used, the link to that is here. The next item I made was a knit blanket. 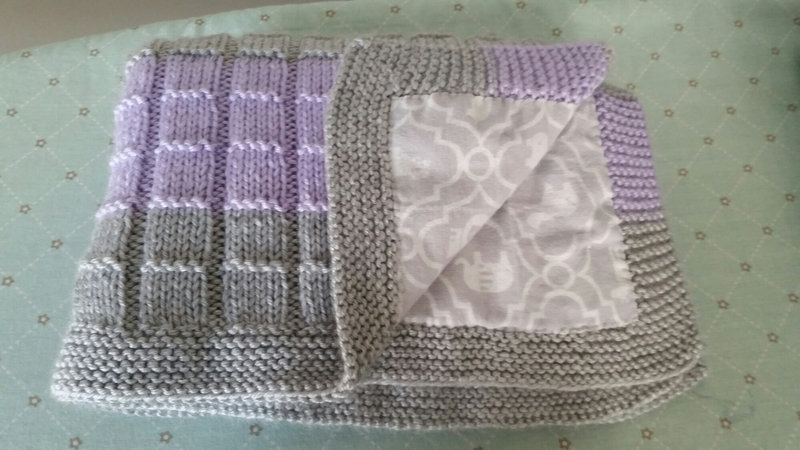 The pattern is Maxi Cosi Blanket, and while I am happy with the way it looks, it is a ribbing pattern – not a tight one, but it did pull the center of the blanket together a bit. I used acrylic yarn but I am wondering if I’d used wool, that I might have been able to block it a lot better. I did back my blanket with some flannel fabric you can see in the photo. I decided it would look better if I hand-stitched it. That was a somewhat long, fiddly process but I am glad I took the time to do it that way. 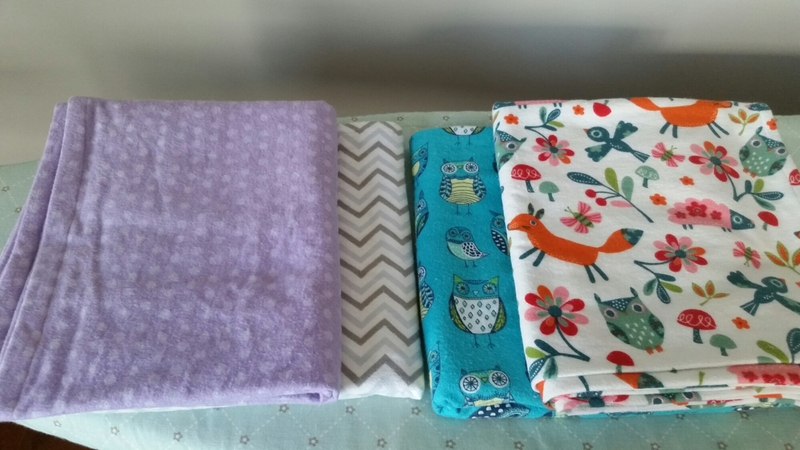 Pictured are also 4 receiving blankets made from cotton flannel. They are very easy to make, just purchase a square of whatever fabric you like and make a simple folded hem. 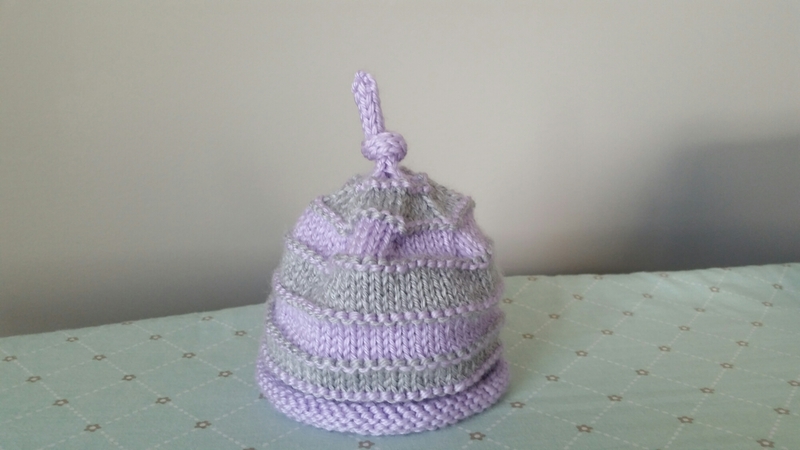 The last item is a pattern I wrote myself for a cute little baby hat. 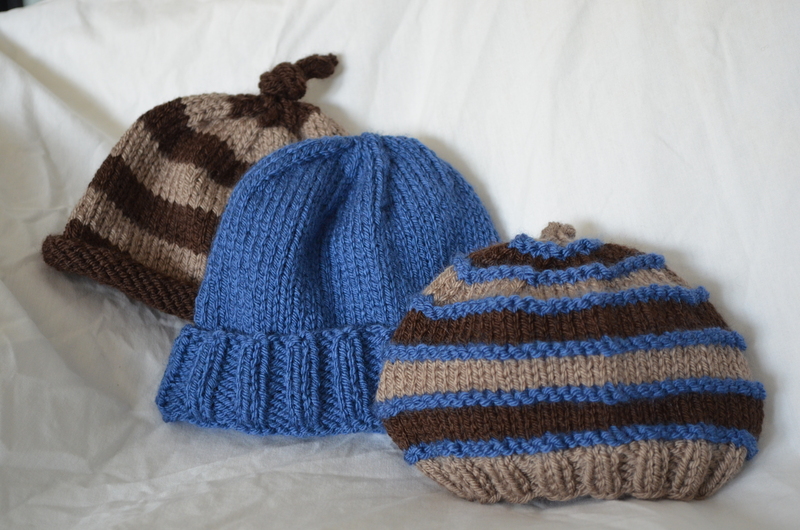 I wrote a trio of baby hats, each with design elements that can be mixed and matched. The Ravelry page is here. 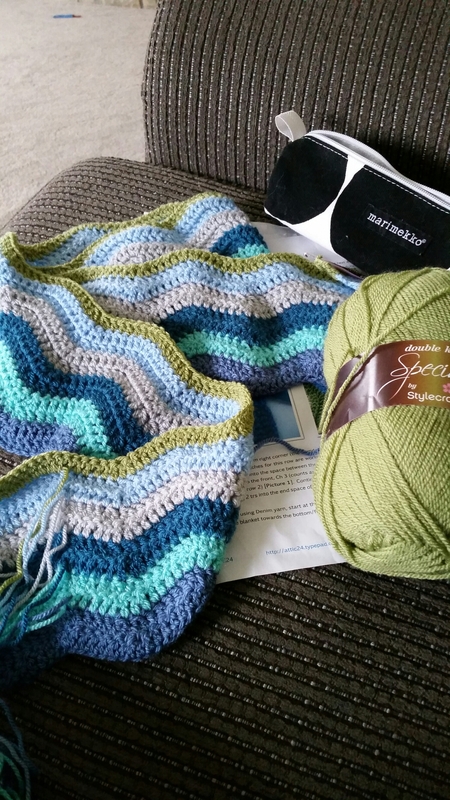 I used the same yarn that I used for the blanket. I have quite a lot of that left so once I get a chance to talk to them, I will ask if they would like anything else. Baby knitting is just so much fun! Everything is so little and soft and cute! And the gratification of finishing a project happens relatively quickly. I am kind of hoping they’d like maybe a few more hats or a little lovey of some sort! UPDATE! Baby Avery came Earthside on February 2, 2017! My package arrived shortly after that and all is well! She is beautiful and perfect and already loved so much! 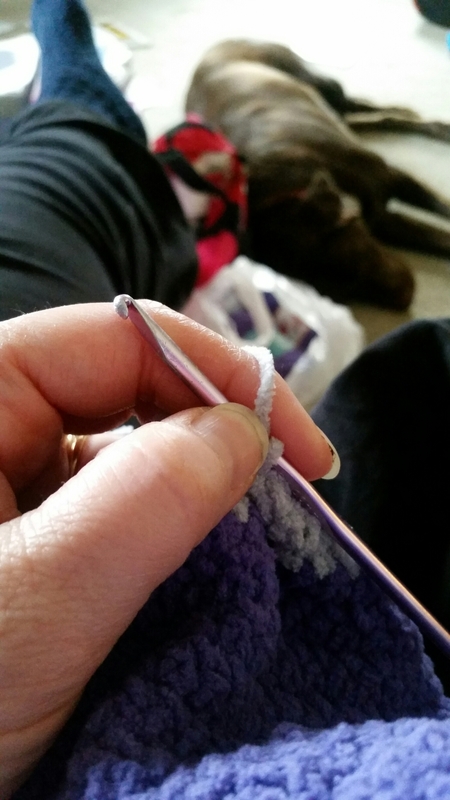 100 days of knitting – progress! My 100 days of knitting has progressed well. I did miss a couple of days in there but overall I knit most of the days since I began on January 8. I have gotten quite a few things done! I finished the hat I was making for my friend. She loves it, it’s a great color for her and fits her well. I have also made good progress on the mittens that were pictured in my last post. They are both done except the thumbs. That part is fiddly but once I get going I should be able to finish them in one sitting. The last big project I’ve done has also involved a bit of sewing. I have a dear lifelong friend who is about to become a grandma, and I knit some baby things for the baby. I will be posting pictures of the baby things once I have mailed them and the proud new parents have seen them… I would hate to have them see this and spoil the surprise! Other than the mittens I have a pair of socks I’m finishing for my sister-in-law. Her daughter is in college and working, and hasn’t had time to sit down and knit her socks! So one day my niece handed me a couple of skeins of yarn and asked me if I would knit some socks for her to give her mom. Because she is my only niece and I love to spoil her, I told her I would be happy to do that. The yarn is heavier (probably a light worsted weight) so the socks have worked up easily and quickly. She already has one pair that I’d finished in time for Christmas. The other pair is about 3/4 of the way done so it won’t take me long. I can see that I’ve been knitting mostly for other people recently and that’s fine. I have been really uninspired lately to knit for myself and there really isn’t anything I need! I do have some really beautiful skeins of sock yarn and a few balls of lace weight yarn but I am somewhat tired of making socks and I really don’t want to deal with working with lace weight yarn at the moment! I am sure once I get these other projects finished, I will sit down and figure out what to make for myself, or maybe I will make my daughter some things for her dolls. I’ve got a book of 18 inch doll clothes patterns that I haven’t tried yet… perhaps I will cast on something from there next. I will also have photos to share in my next post as I do not want to share photos here before the recipients have a chance to see what I’ve made for them! I have a few projects in the works right now. 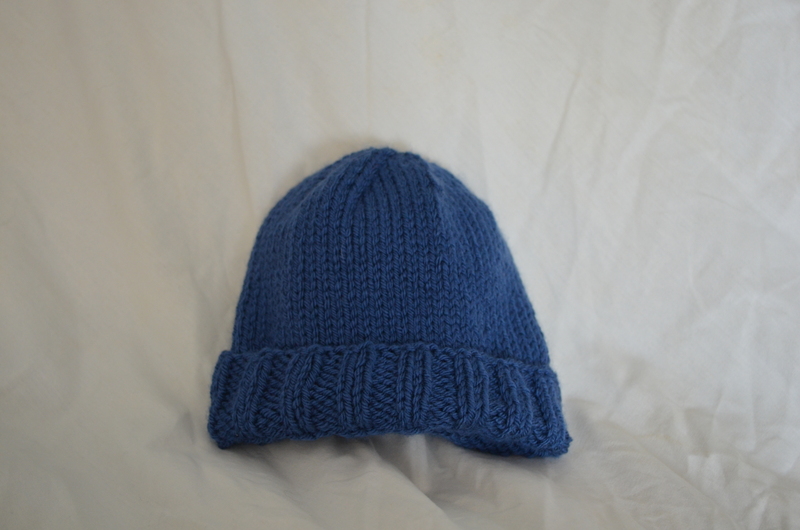 One I recently finished was a hat that I made from Cascade superwash bulky in a beautiful shade of purple. That was commissioned by a friend. The same friend has also asked me to make her some mittens so those are in the works too. My third project is for a dear lifetime friend’s son and daughter in law who are having their first baby next month. Oh the sweet joys of baby knitting! All those cute little hats and socks! I want to get those sent off to the new parents before I post any pictures so you’ll all just have to wait on those! I realized late last year that I’ve been knitting seriously (not including the failed attempts at learning) for 10 years. Knitting (and some good friends, including Carolynn) helped me get through the insanity years of having small children and not getting enough sleep or enough breaks. It helped me cope with the loss of a dear friend to suicide. I have created warm garments for myself and many others. I’ve made a few fun things too! It is very relaxing and calming and a good way to be mindful. And as I mentioned before it’s a good activity when it’s just too nasty to be outside much. Carolynn has restarted her CinnamonStitches blog just recently and has inspired me to do the same. And I have inspired her to do 100 days of knitting too! So, let’s see what we can do together. 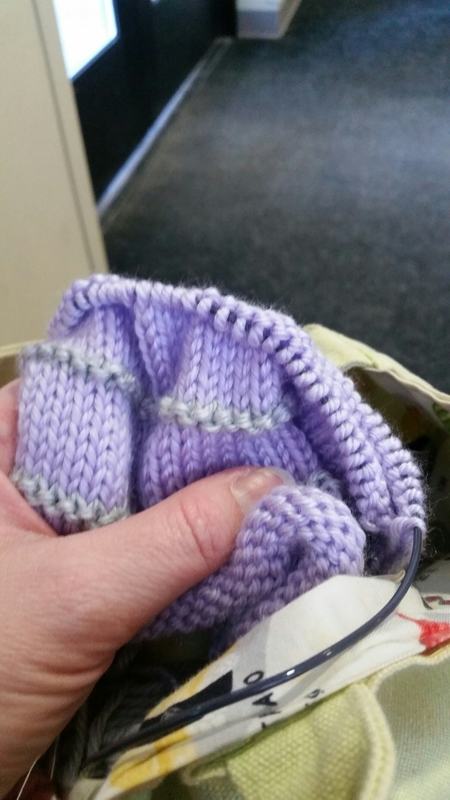 For now, here is the mitten I’m making for my friend. 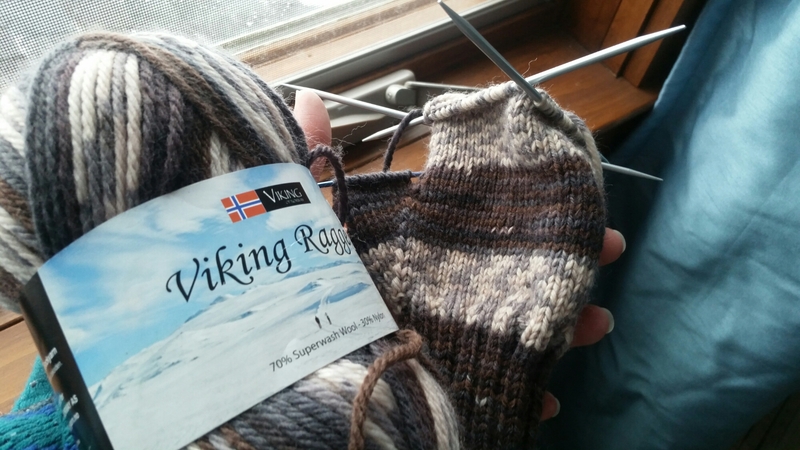 I am using Viking Raggen worsted weight sock yarn on #3 needles. They should be nice and dense to keep her warm while doing outdoor winter chores. In spring of 2013, my husband and I began the long task of designing and building a house. We moved in about 6 months ago, while still in the process of finishing the house ourselves! Finally it is mostly done and we are settling in quite nicely. 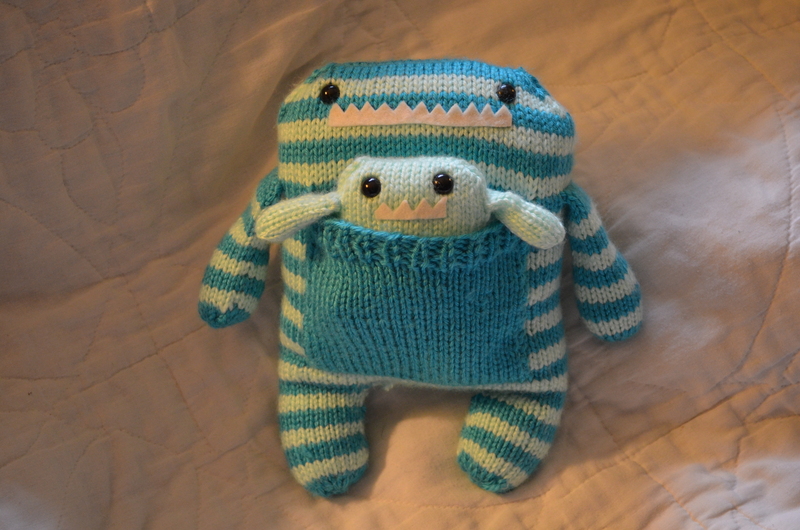 Lucy at Attic 24 is a crocheter and lives in England. I could get (and have gotten) lost in her blog for hours. She takes such beautiful photos of the English countryside and her little town. The colors she chooses for her projects are mouthwatering… most of them are taken from flowers and other things in nature. The way she combines colors makes me ridiculously happy! She has kits available from a company called Wool Warehouse in England. I had drooled over these kits for ages but had not had the time to start any large projects. 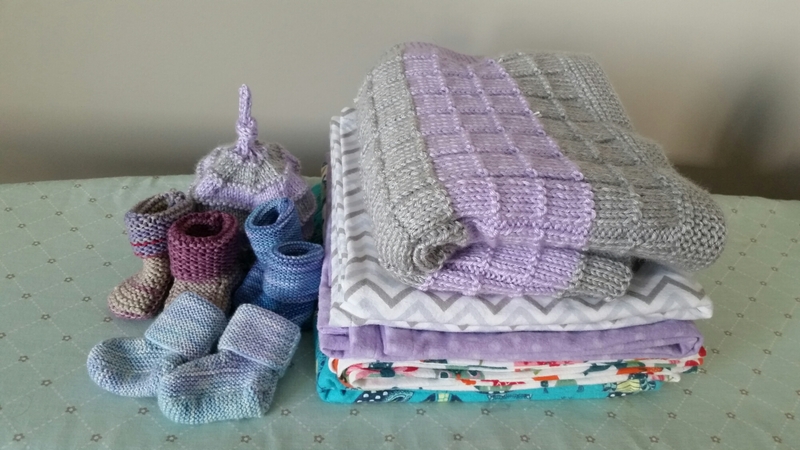 Finally the house was done and I decided to reward myself with an afghan kit – I decided on the Coast Ripple blanket kit. Making this purchase from the UK was very easy. The exchange rate was good for me, a £25 kit only cost me about $38 which included 15 balls of yarn at 100 g each, plus shipping via air mail. It arrived in about 10 days, and came in this sweet little bag! It came with directions for the blanket too. I just love how these colors glow! I am having fun making it. I had to make some notes as the UK crochet terms are a little different than here in the US, but I love how this looks! This project is made with DK weight yarn and I am using a 4.0 mm hook (G hook in the US). This has been such a delightful project to start and it’s very easy and intuitive… even though I do more knitting than crochet, I am really enjoying this! Today I had a nice quiet day ahead of me with both children at school and nothing on my calendar. Everyone has been sick for the past week except me and I needed a restful day. 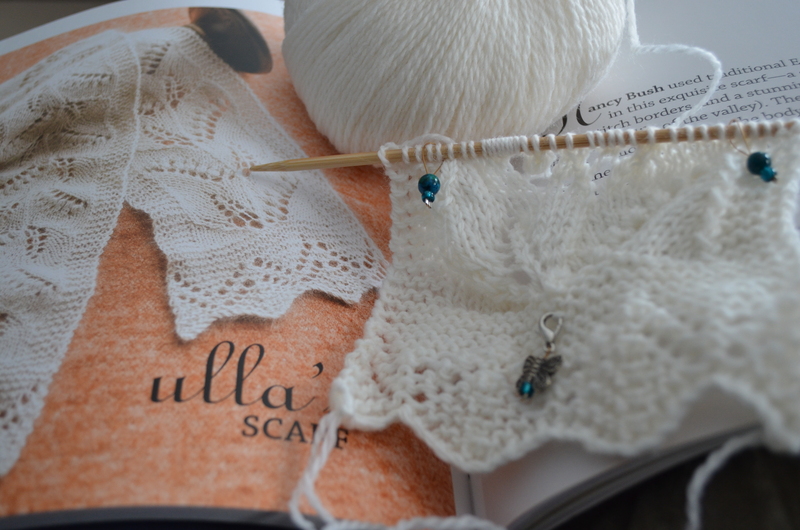 What better way to get rest, than to knit Estonian lace for the first time? This is a Nancy Bush pattern, Ulla’s Scarf, from Ann Budd’s “Knitted Gifts” book. 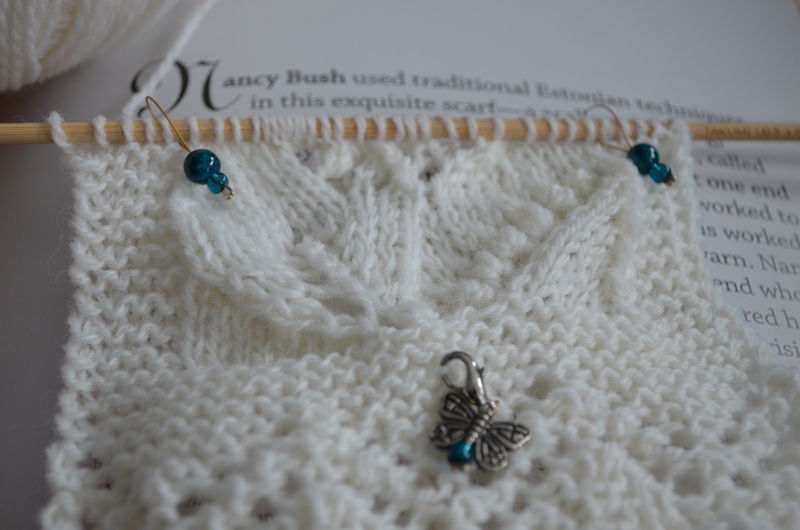 I am using Knit Picks Palette in white, with US size 5 needles. I cast on and was quite relaxed while making the lace border. It seemed straightforward enough. However, as I started to approach the lines in the charts with the nupps, I started feeling nervous. Anyone who has knit lace or has looked into it will know that a nupp is a little knitted nubbin – consisting of knittng/making yarn overs FIVE times into one stitch, then purling those 5 stitches together coming across the back. I have heard so many complaints from lace knitters about nupps. I feared them and they actually stopped me from casting on this scarf many times. Oh goodness, please ignore the dirt under my fingernail. I’m a mother, OK? Anyway, that little blob of yarn there is a nupp. And I used to be afraid of them, but no more. I have learned two secrets to knitting them without fear. One is to knit the 5 stitches as loosely as you can, like obscenely loose. Then as you come across the back side and need to purl them all together, don’t even try with your regular sized needle. Grab the tiniest sock needle you own (I think mine is seriously a 000, what on earth I was planning to knit with a size 000 needle, I have no idea, but the thought of it makes me slap-happy) and tuck it into all 5 of those stitches, grab your working yarn with the end of it and hold it tight, then just purl that nupp with the skinny needle, and slip back on to your right hand needle. Piece of cake. Well, not as easy as purling one stitch with normal sized yarn and regular sized needles, but it is a good way to not fear the nupp. I love lily of the valley and it would look all wrong without the nupps. I am glad I figured out how to make peace with them. My daughter has been home from school sick for the past two days. Today she is better but still needed a day to rest. I got out some tools I thought she might enjoy, but it turned out that at 6 years old, she isn’t quite ready to use them. There is my childhood potholder loom, which she was able to warp without a problem but even I had issues with the weft. (I’d actually put a sign on the house in my childhood, trying to get people to stop and buy some!) 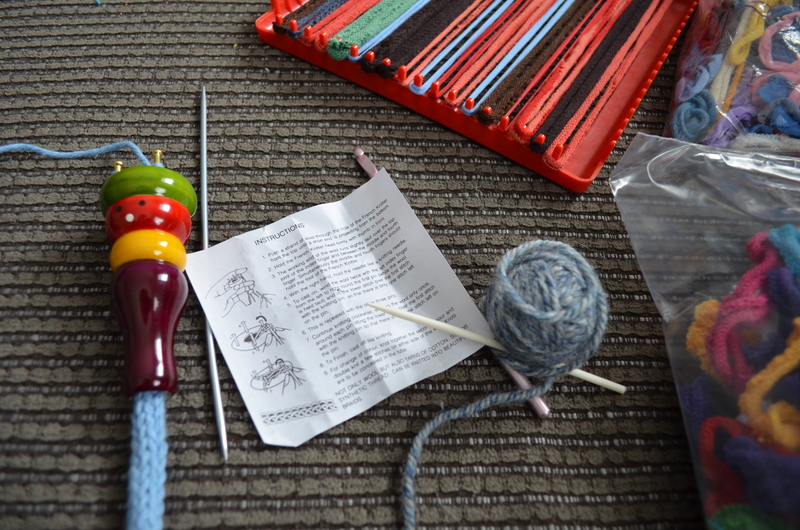 The other tool is a neat I-cord knitting loom made by Lion Brand Yarns. It was a little tricky to get it cast on, but once I changed to cotton yarn (that wasn’t fuzzy and splitty) I was able to get in the groove. Not sure what I would do with a bunch of I-cord, although I believe the Mason-Dixon Knitting ladies had an idea for a rug in one of their books! Tuesday was my daughter’s birthday. (She started getting sick Tuesday evening.) 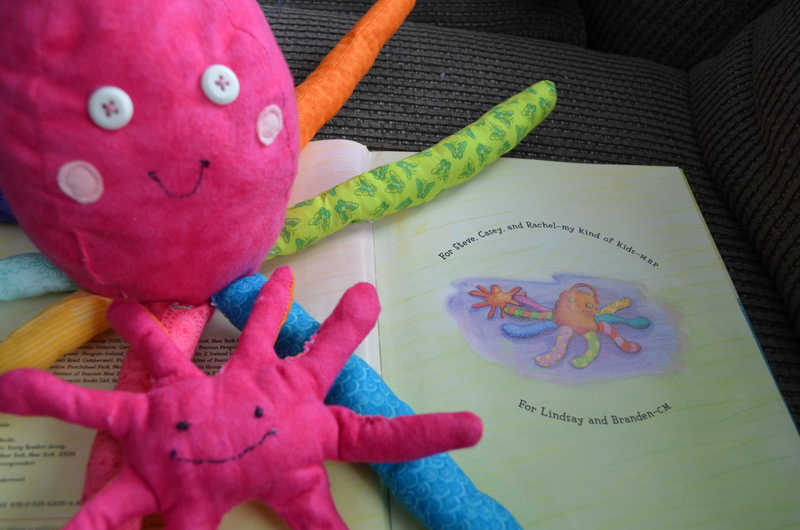 She has a book called “Your Kind of Mommy” and there is this little patchwork, stuffed octopus in the book. The octopus shows up in several places in the book but just inside the front cover, the octopus is with her baby – affectionately named “baby splat” by me and my daughter. She asked me if I could make them both for her and I told her I probably could, as my sewing skills are not bad. A bit rusty, but I used to make my own clothes and I was a costume shop assistant at the theater when I was in college. So, here are mama and baby splat along with the photo of the inside cover of the book. I did use a tutorial to help get me started on the mama octopus – Oopsie the Octopus by Moda Bake Shop. I couldn’t have figured out how to attach the legs and the bottom. This is a great little tutorial and it’s free with a printable pattern, so if you’re inclined to sew an octopus, check it out! 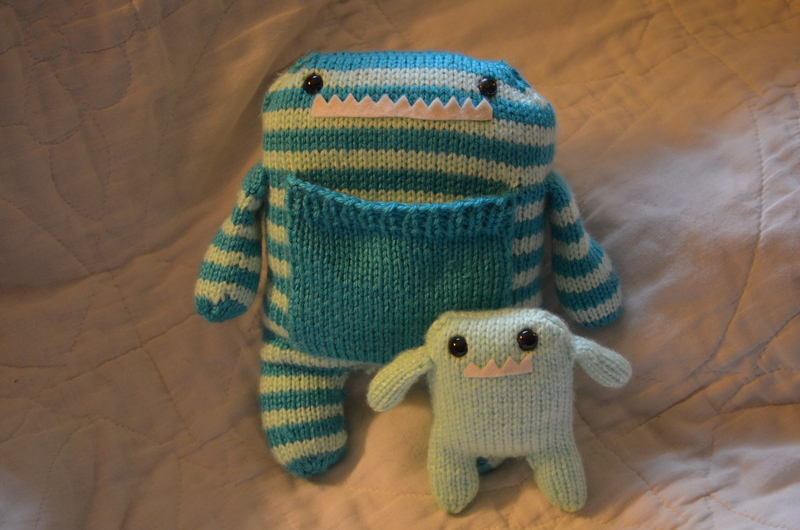 I have recently knitted a pair of monsters for 600 Monsters Strong, a group that was formed on Ravelry in response to the Sandy Hill school shootings. It first began in an effort to provide the kids at Sandy Hook with cuddly toys, but has since expanded to donate monsters to any child who has experienced gun violence. Check them out on Ravelry or on Facebook. The pattern I used is Daphne and Delilah. They were knit with Caron Simply Soft and stuffed with polyester fiber fill. I used safety eyes (6mm I think) and the mouth is felt that was glued on with fabric glue. Doesn’t this just make you go squeeeeee? Both my kids want them now. I knew my daughter would but for my son to also want one is a big deal! I have a friend who is pregnant and expecting a little boy this winter. She asked me if I would knit some baby hats in what she said “masculine colors”. So I went out shopping and picked up some Paton’s Canadiana, which is 100% acrylic, very soft, very springy, and not at all like other cheaper squeaky acrylic yarns. I found a deep chocolate brown, a lovely taupey tan, and a denim blue. I had some ideas in my head for some hats and after working on them, I thought I would actually take the time to write down what I did (gasp!) and offer up the patterns. It’s been a while since I posted a pattern. So I am long overdue. The size of these hats is 0-3 months. For all of these hats, I used a size 7 long circular needle and used the Magic Loop method. 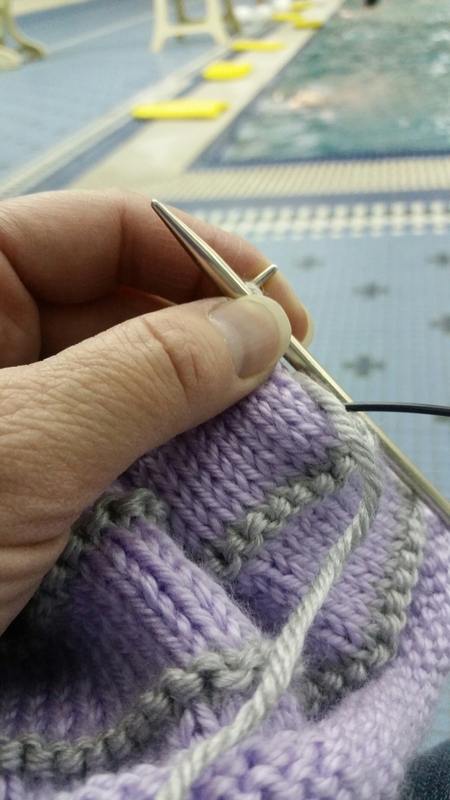 You can use double pointed needles or one or two short circulars if that’s your thing. I prefer the Magic Loop method so that’s what I did. The yarn I used is Patons Canadiana which is worsted weight. The colors I chose were Timber (dark brown), Toasty Grey (taupe) and Dark Water Blue. 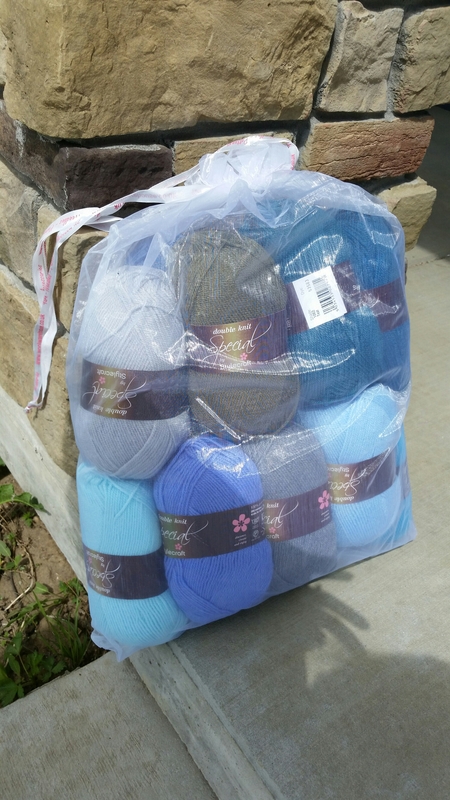 I bought one skein of each color and there are 205 yards in each skein. Cast on 64 stitches and join to knit in the round (again, using the tools you prefer for knitting in the round). Knit 2×2 ribbing (K2, P2) until the brim measures 1 1/2 inches long. Switch to stockinette stitch (knitting all stitches) until the piece is about 6 inches from the edge of the brim. This will allow the brim to be folded up. 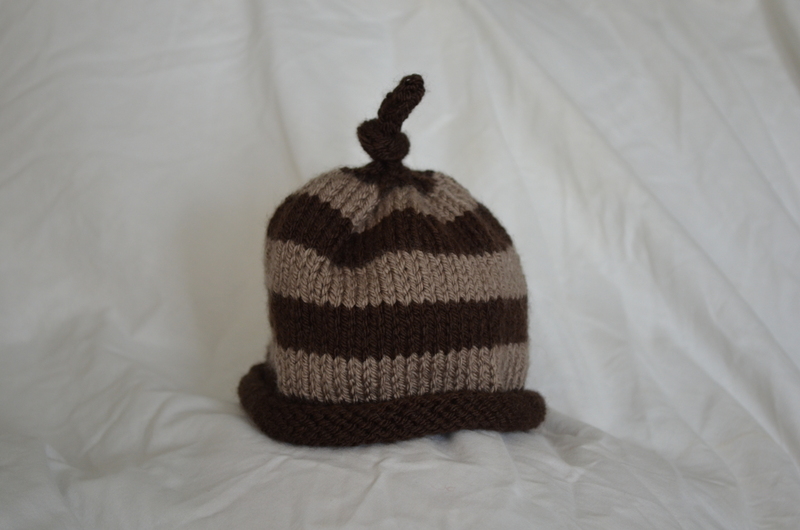 If you do not want to fold up the brim, you can knit in stockinette stitch until the piece is 3 1/2 inches long. Once the piece is to the desired length, start decreasing. (K6, K2tog) until end of round. (K5, K2tog) until end of round. (K4, K2tog) until end of round. (K3, K2tog) until end of round. (K2, K2tog) until end of round. (K1, K2tog) until end of round. K2tog until end of round. 8 stitches left. Cut yarn and using a tapestry needle, draw yarn through all remaining stitches and secure. Weave in ends. You will need two colors for this pattern. Choose a main color (MC) and a contrasting color (CC). 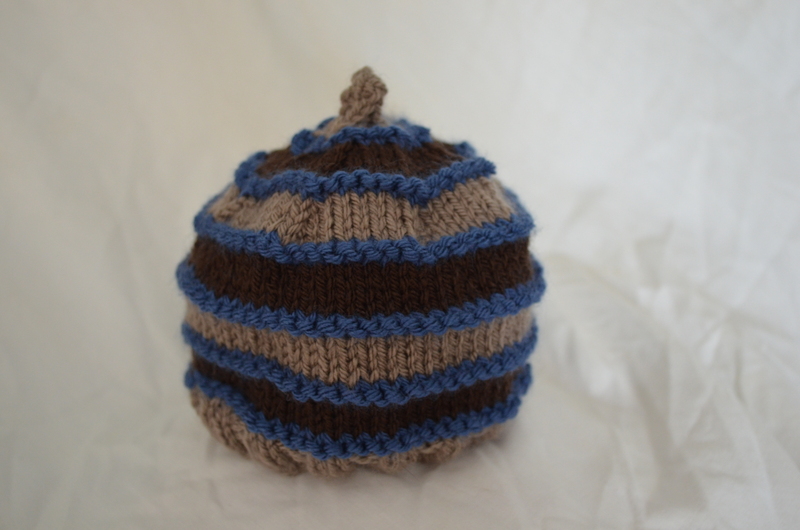 Cast on 64 stitches in MC and join to knit in the round (again, using the tools you prefer for knitting in the round). Knit in stockinette stitch until the edge is curled enough for what you want. I knit 11 rows on the hat in the picture. You will want it to curl, yet still be able to see some of the stockinette stitch. Switch to CC, and knit 5 rows. Switch to MC, and knit 5 rows. Switch to MC, and knit 3 rows. Using MC, (K6, K2tog) until end of round. Knit 1 round in MC. Switch to CC for the next 5 rounds. K2tog until end – 8 stitches remaining. K2tog until end – 4 stitches remaining. Using a double pointed needle, slide all 4 stitches on to one double pointed needle and work an I-cord until it is long enough to be tied in a knot. I knit mine to 3 1/2 inches. Bind off and weave in ends. You will need to take some extra time to weave in ends inside the hat if you did not carry your yarn colors all the way through the color changes. You will need three colors for this hat: A Main Color (MC), about the same amount for the first Contrasting Color (CC1) and a small amount for the second Contrasting Color (CC2). This would be a good stash-busting project. 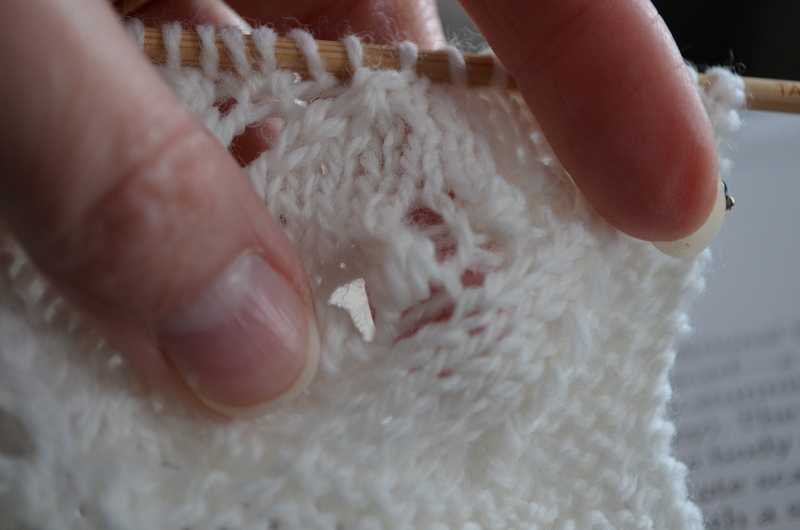 Cast on 64 stitches in MC and join to knit in the round (again, using the tools you prefer for knitting in the round). Work in 2×2 ribbing (K2, P2) until the piece is 1 inch long. Change to CC2: K 1 row, then P the next row. This makes a garter stitch ridge. I will refer to these two rows in CC2 as the garter stitch ridge throughout the rest of this pattern. Change to CC1. Knit 4 rows. Change to CC2. 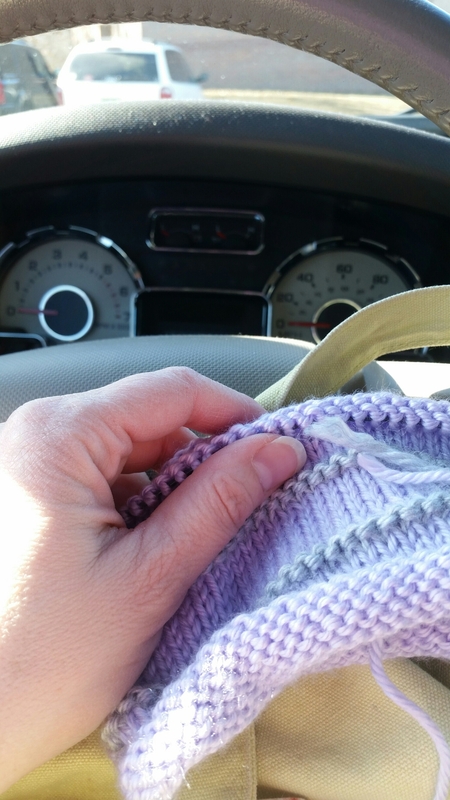 Knit a garter stitch ridge. Change to MC. Knit 4 rows. Change to MC. Knit 2 rows only. (K6, K2tog) to end of round. (K5, K2tog) to end of round. (K4, K2tog) to end of round. (K3, K2tog) to end of round. (K2, K2tog) to end of round. (K1, K2tog) to end of round. K2tog around – 8 stitches left. K2tog around – 4 stitches left. If you wish, put all stitches on 1 double pointed needle and knit 4 rows of I-cord for decorative finish. If you want to omit this part, you can cut yarn at 8 stitches and draw end of yarn through the 8 stitches with a tapestry needle and secure. Then leave plain, or add pom pom or tassel.